Since the vote I have been contacted by 15 people in the Folwell neighborhood 7 in agreement with the decision, and 8 against. Only a couple people making personal attacks, but still disappointing. That kind of division lets me know this needs some more discussion. I would be lying if I said that every concern has been addressed, they haven’t. However infill projects seldom are perfect solutions. Community and neighborhood benefits and impacts certainly fall short of perfection, however I see them as being greater than both the status quo and other development in the area. In addition the project has the support of 3 neighborhood association presidents, Imagine Kutzky, CUDE, County Planning, City Engineering, and several (but admittedly a minority of) neighbors living in the neighborhood. Approvals are (or should) always be based on whether evidence indicates the development meets the criteria for approval. Not everything was black & white but clearly the evidence in this case convinced the city council, staff, and long time neighborhood leaders that this project met all requirements. Architecture – All 3 streets have well designed, activated spaces. All 3 streets are going to be incredibly pedestrian friendly. 14th Ave and 2nd street will look and feel so much better than today. In terms of architecture I believe this is the finest building I have seen proposed in Rochester in my 8 years. The building is permeable (windows & doors) on the ground floor like any good building should be. Materials – Top notch materials throughout the building. When looking at these things on paper it is hard to envision just how much better these materials are than many others on 2nd street. Setbacks – The final setback creates great pedestrians spaces around the building, the boulevards are done in such a way to support healthy street trees. Neighborhood transition – This cleans up the tired Raymar & Brentwood buildings, many deteriorated properties or blank lots, as well as 5 homes in pretty good condition on 15th ave (3 of which have long been planned for redevelopment). 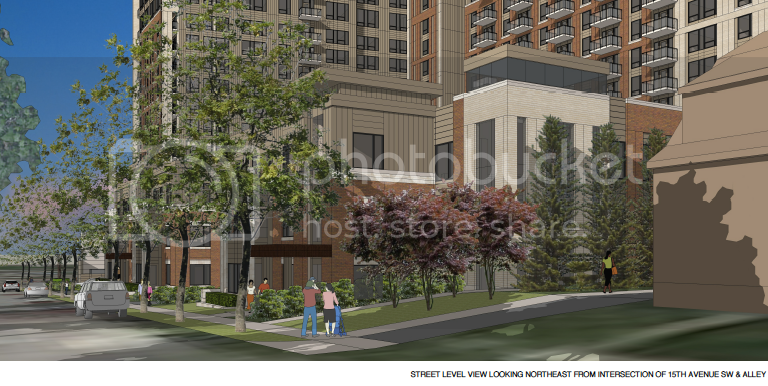 Uses – As Don Nordine said, I am excited to have uses that contribute to the neighborhood, not another hotel. In this case the neighborhood is likely to get a great restaurant, additional retail, and high quality housing. Process – Never in 8 years have I seen so many meetings between developers, landowners, and neighbors. Some people are unhappy with the final product, but I can see how the neighborhood significantly shaped what is there. 2nd street – This project will help facilitate a safer, more attractive, more efficient 2nd street. Height – In a perfect world I would have loved to see the entire building look and feel like the 3 story portions. 2-4 story buildings are fantastic for pedestrians. Home demolition – 3 homes were planned for redevelopment, in the end 2 additional will be taken. The 5 homes are nice older homes. They are neither historic nor affordable. Official Map 19 – The building is well constructed to work with official map 19, but we don’t yet understand when and how we execute on that map. In the meantime, while the ramps is well hidden the Southern ingress & egress are near some existing homes. County Planning – Because of our poor ability to keep our existing codes current, there was a great deal of confusion in the application of plans and restricted criteria. In particular the draft DMC guidelines do allow tall buildings on this site, but do not provide any guidance on those tall buildings or where they are appropriate. Condos – I really wanted the town homes to be ownership properties, they are not. The cause probably has more to do with state law than developer decisions. A complicating factor in this decision was the extent of neighborhood interaction and the differing opinions. Neighbors seldom get to have the kind of early discussion with developers that the Folwell neighborhood did. Initial invitations to meet with the development team were sent to the entire neighborhood distribution list, no one was excluded. Additional meetings were either with all neighbors or a self selecting group that worked more on details, no one was excluded. Unfortunately this was both a strength and weakness as many of the neighbors that were most opposed to the project did not attend many of these meetings. They did not see the give and take. They didn’t see reactions to options thrown out. Neighbors in earlier meetings were excited about the prospects of residential instead of hotel or office. The neighbors very much wanted a great transition to the neighborhood, they wanted great materials, they wanted great architecture. Somewhere in the discussions the option of having a taller building on the corner of 2nd & 14th was suggested. I believe this was in late 2015. In early 2016 I checked in with the city attorney to see if a taller building was even possible given the 2nd street plan. It was allowed if a restricted development was submitted. At the time the suggestion was either 10 or 11 stories. When the project came back it was 13 stories at 2nd & 14th, good architecture, an oversized parking garage, multiple garage entrances, and somewhat small setbacks. With the pictures out there many people that had not attended or been engaged in the process became more engaged. In general many loved the architecture, uses, transition, materials but didn’t like the height and feared the traffic impacts. I believe the problem is that the height was effectively paying for the other items that were liked. This is something I will verify before the final hearing. The particularly disheartening part of this was the personal attacks directed towards long time neighborhood leaders. The conditions in the first version of the project probably would not have gained staff or council support. Because of a surplus of parking that would likely be used as contract parking there would have been far more auto trips at the worst times. The developer based on feedback from staff and neighbors eliminated this and resized the parking to what was needed to serve the project. An additional concern was business traffic using the neighborhood street (15th Ave.) would create traffic issues on the residential street. 14th Ave & 2nd St. are both higher level streets. The developer actually went so far as to split up the garage so only people living in the building would use the residential street. Business parking is only off 14th. Additionally the developer will be making the city street North bound only just to the South of the project. This project evidence completely convinced city engineer that traffic criteria had been met. In the big picture it is important that each automobile trip has both origination and destination. When both the two are close they can be replaced with walking. This means that if there are going to be thousands of jobs in the St. Marys Place area the only true ways to reduce traffic is through transit, bike, or walk. This probably takes several hundred future commuters off the road at peak times. The tower at 2nd & 14th is 13 stories. This height leaves it just a little bit shorter than the East & West towers across 14th Ave. This is tall, however to to say that this is a monstrosity when it is about the height as what is across the road is probably not fair. In reality the tower at the corner is similar to what is across the street, additionally the residences on 15th & 14th are similar in height to the rest of the neighborhood. Larger setbacks allowing large street trees and landscaping also work to enhance the neighborhood, especially from a pedestrian standpoint. One factor that weighed heavily in my decision that general compatibility was met is the projects Floor Area Ratio (FAR). This is roughly the square footage in the building divided by the square footage of the site. I say roughly because the parking areas are not 1 to 1. The FAR for this project was about 3.5 meaning the actual average height of this project is about about 3.5 stories, probably closer to 4 when parking impacts are considered. The often cited 2nd street corridor study allows densities higher than this. While the building is tall, the density is actually very reasonable for the area and far lower than I would have guessed. Data is often counterintuitive when evaluating criteria. The building height is scary but reasonable, the density is not an issue. One of the criteria references primary views from residences and was probably the one I struggled with the most. Hopefully some folks will settle down and emotions will give way to focus on other challenges that we must meet together. There are many challenges ahead. There are also tremendous opportunities to improve the neighborhood, make it safer, and address long term concerns that were reference, but not related to this project. As this project is likely to request TIF, the city will have the ability to independently review finances, evaluate if the projected returns are reasonable. The implication has always been that the size of the building is needed to make it work on the site. While I expect that this is true, I like to verify. I am also interested if the financing leaves any room for affordable units. Once the city passes an inclusionary housing ordinance this would become an expectation. I hope that this happens. The community comprehensive plan is being updated, after that we also need the land use plan, zoning, and neighborhood level plans updated. Much of the consternation over this and other projects comes from a lack of definition going into the process. We need to set neighborhood level expectation for preservation and redevelopment. Certainly the 1 block off 2nd street will redevelop in Folwell, but the rest of the neighborhood should remain an urban residential area. Given the proximity of the residential structures to St. Marys property values are likely to continue to rise in the area. Here is a statement I read before the hearing after an insinuation that that was made. I am in the receipt of a call for my recusal because of an alleged bias or lack of impartiality on the merits of this project. I have not publicly or privately expressed an opinion on the merits of the proposal. I have however had meetings with every person that has requested such a meeting. I have no direct, indirect, or implied personal interest in this project. Since the letter was a suggestion and not a demand I will maintain the actual communication as private for now. I have great respect for the letter’s 2 authors and as such thoughtfully considered whether I can make a judgement on the basis of evidence. I have absolutely no reservations that this is the case. I reviewed Ethical Practices Board Opinion #09-01 and am confident that my continued involvement in this matter is consistent with that opinion. In particular, I note that both “attending meetings at which the merits of a pending proposal are discussed” and “listening to constituents or interested parties to inform myself of an impending appeal” are explicitly allowed by the EPB guidance. And frankly they are just part of doing a decent job… Bottom line, I still place my integrity and that of the community before all else, and I owe it to every person that has expressed a view or concern to me to continue as part of this process. I heard a muddled comment on the webcast of the council meeting that could be construed that (only residential traffic on 15th) way, but I do not believe “all business parking is off 14th” is a true statement. Maybe the business parking spots are on the 14th Ave or 2nd St side of the lot, but that is a different statement, since they are connected. I would be happy to be wrong; did I miss something? Please let me know if I did! Traffic remains my chief concern at this point. I give the choker a 50/50 chance of actually happening — has public works (I’m thinking snow plows) signed off on something like that before? Even if it does occur, I expect it will be ignored unless there is oncoming traffic. Even if my fear is unfounded, if/when The Blessed and Official Map 19 occurs, it will make it near pointless, as the traffic can zip over to 16th, zoom through two residential corners and one residential intersection, and be back up to the problem 15th Ave & 6th intersection. (Or will 16th have a matching choker?) And I’m not even touching the mental gymnastics required to claim the increase on 15th is less than 25%. I don’t think there is space, but to me, Map 19 with cul-de-sacs for 15th and 16th would be preferable, but then it (3rd Ave) is essentially a publicly funded driveway for the building. It’s also impossible for us to know if they ever really thought the contract parking would sail, but it sure makes a nice “look at how much we cut” and “look how much the traffic improved” bullet point. Starting high is Bargaining 101. I’ve already discussed this with you separately, but this still needs to be amended a little. Mayo expands parking privileges based on actual lot utilization, not on “we have N spots, so there are N parking tags.” For whatever percentage of the building works at Mayo, then, the benefit to commuter traffic through St. Marys Place is exactly zero, as the distribution of parking tags will increase until the lots are at their target utilization. For each individual living here that works somewhere other than Mayo/walking distance, it will *increase commuter traffic* though St. Marys Place. It is true that its location (rather than out in a burb) will reduce traffic to park-and-ride or shuttle lots. So yes, it *will* take commuters off the road, just not in the most congested areas. 3) I wasn’t able to make it to this meeting, and it wasn’t brought up; I would be interested to see if there is any literature re: helicopter noise amplification from the focused reflection off the towers into the neighborhood. (I brought it up at P&Z.) Are there any material choices that could improve or should be avoided for said concerns? 4) Can you parse the Parks and Rec response for me? Thank you for taking the time to continue the discussion. I would rather see this development than a six-story cube hotel, but I’m still worried about traffic. Thanks for all the thoughtful questions. I will verify residential only on 15th, I believe that chance has been executed. The choker will likely be a condition of approval. The issue of Mayo and parking needs to continue, as soon as they stop subsidizing parking transit will improve everywhere. We will be discussing this some with the St. Marys Place group. I would love to have your voice there. I suspect that eventually nearly all on site parking will be for patients. #3) is a great question and I will pass that along. I would be surprised if it was much different than St Marys, but worth asking. #4) help me out? parks & rec? Traffic is the concern, the traffic engineer is confident and I have great respect for him, we need a safer 2nd street regardless of project. Eric, I did confrim with both the the city engineer & developer. The ramp access on 15th is for residential traffic only.